Blue Raster is pleased to announce a partnership with Avenir Health, which is dedicated to assisting developing countries design and implement public health and social programs. 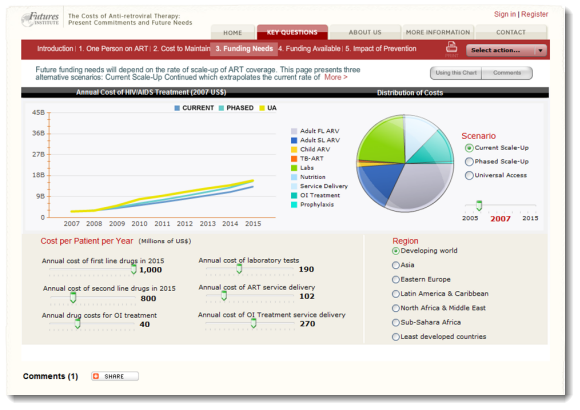 For a project funded by the Bill and Melinda Gates Foundation, Avenir Health required an interactive application that would provide users with information regarding the Costs of anti-retroviral therapy (ART) globally, and would predict changes over the long term based on user-defined variables. Blue Raster applied models for long-range planning, and created an interactive Adobe Flex application which was developed using Xcelsius. The new application allows users to set goals, strategies, and objectives while providing feedback on different outcomes. Centered on five questions related to the future commitment to anti-retroviral treatment in the developing world, the application is a powerful tool for those looking to understand the positive consequences of rapid scale-up of treatment. For more information regarding the Future ART Costs application, visit avenirhealth.org/PolicyTools/FC/.